With shrunken children like these…? 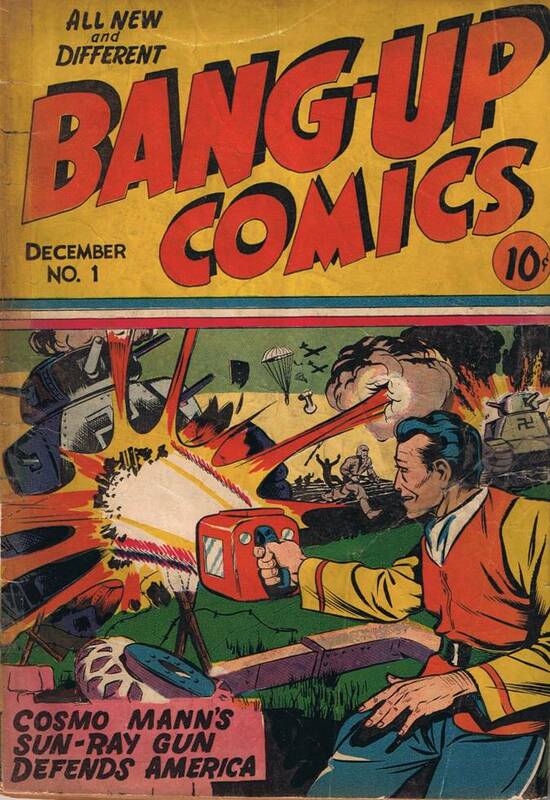 There’s something to be said about the unparalleled insanity of a typical Golden Age comic book. 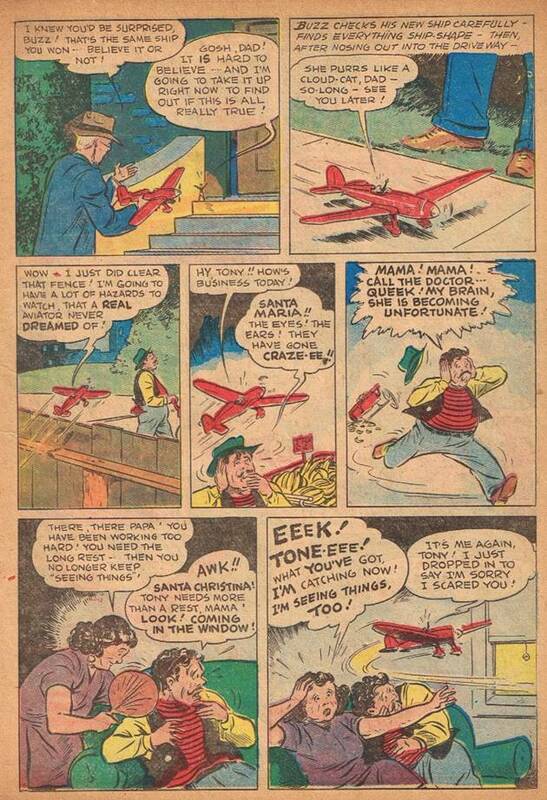 Hidden in some admittedly crude drawings (explainable by the sheer insane workload a typical artist was given during the comic book heydays of the 40s) are some of the most bizarre and mind-boggling stuff you could possibly imagine. Sure, imagery is one thing, but when you couple it with a story that makes about as much sense as a directionless art house movie and then market it to children, you have to wonder how anyone could come out of that era with their wits intact (then again, maybe they didn’t). 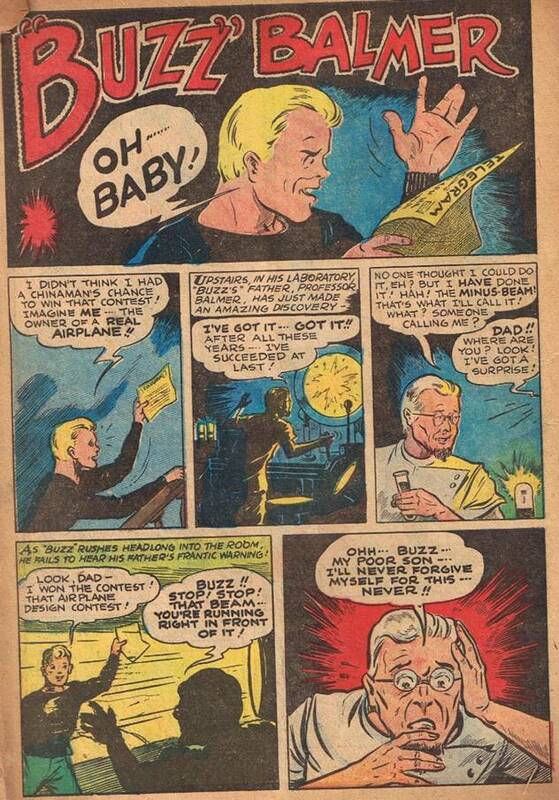 Sadly at no point in this issue does Cosmo Mann fend off a Nazi troop advance with his Sun-Ray. Of course that could be a good thing, just one shot to his very exposed head might’ve made for one of the shortest superhero comic strips in history. Sort of like if the first crook Superman saw in Action #1 whipped out some kryptonite and killed the Man of Steel right off the bat. I’d demand my 10 cents back, I would. Okay, please remember times were different back then, so, you know, racism. 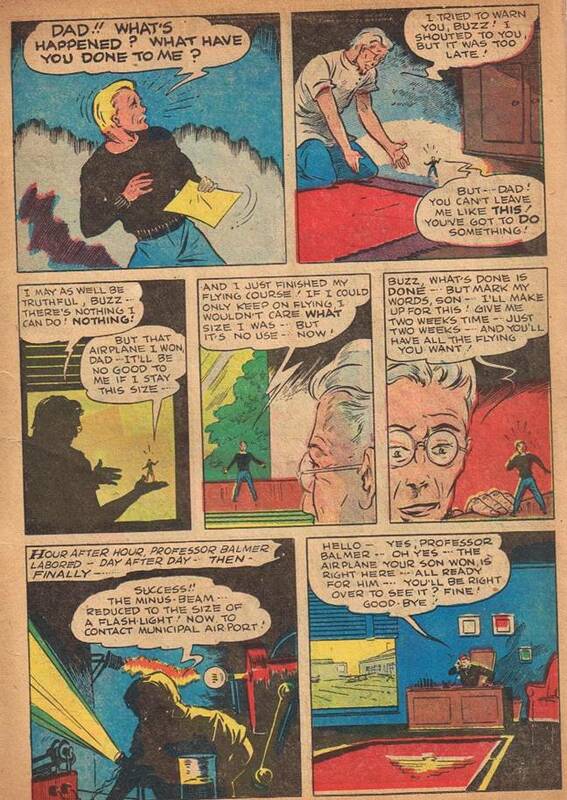 Secondly, as is typical of most superhero origin stories of the day, this kid will gain some sort of power through not hard work, ingenuity and invention (that part of the equation usually belongs to someone else), but by sheer idiocy. Buzz’s father is clearly a smart man, he’s wearing a lab coat after all, and his son is clearly… not. Then again having the kid knock first and wait for his dad to open the door would’ve made for a short comic. Now you know where the original idea for ‘Honey I Shrunk the Kids’ came from. Give yourself a pat on the back for gaining another bit of useless trivia. Now, here’s a major bit of difference, in ‘Honey I Shrunk the Kids’ the shrunken kids were hell bent on getting de-shrunk – a rather rational thing to want. In this case, Buzz is hell bent on getting his airplane and flying. And his dad, his genius of a father, proceeds to ignore his shrunken son for a couple of weeks to make his ‘minus beam’ into a portable flashlight size. Rather than, you know, trying to reverse the beam effects. So, Prof Balmer wanted a smaller ‘minus beam’ so he could shrink down the plane his son won. Well, I guess that’s kind of sweet – until you realize he just exposed his invention to the public. That is, his unregistered and unpatented invention. Heck, he even gave a nice demonstration of it’s military use right there – imagine shrinking down the enemy’s army as they march at you – all you’d have to do is step on them afterwards. Imagine the bullets you’d save! Now think about it for a second. Buzz’s dad feels bad, sure, so to appease his small son he’s going to give him a fully working aircraft so that the kid, a novice pilot, can fly around the neighborhood. A neighborhood full of flying birds, flying airplanes, high electrical poles, clotheslines, trees and… well… you get the picture. You know, the name Balmer seems remarkably apt for this family, they really don’t seem to think things through. Poor Tony, in all his lunatic haste he wrecked his banana cart! Here’s a question, how the hell are these people hearing Buzz’s words? At his size even his loudest yell wouldn’t be louder than a dozen insect farts. 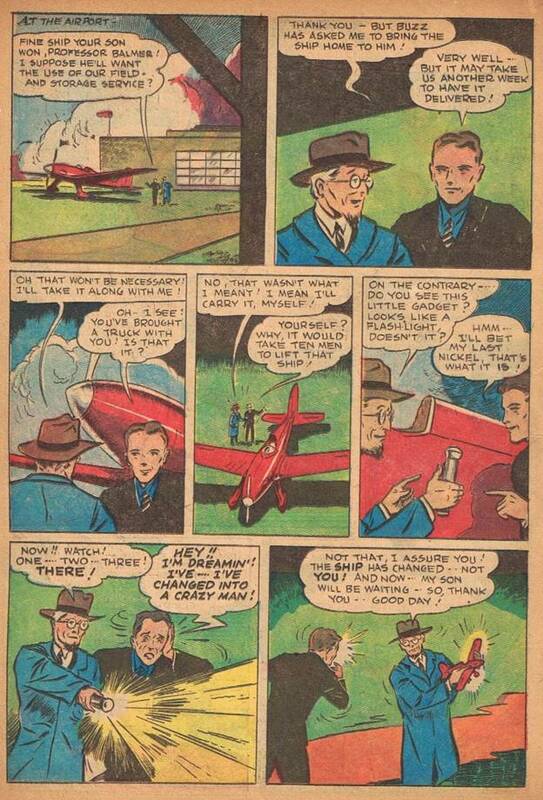 So, keeping that in mind, what’s actually happening in the panels above is that Tony and his wife are being scared to death by… a toy airplane that’s run amok? Still, maybe they deserve it. Trying to live off of selling bananas at 2 for a nickel seems idiotic in its own right. Tony would have to shill 4 bananas just to afford this comic book! How the heck is he even making his rent payments??? However he’s doing it, it’s going to be a lot tougher now that he’s wrecked his cart fleeing from a toy airplane.